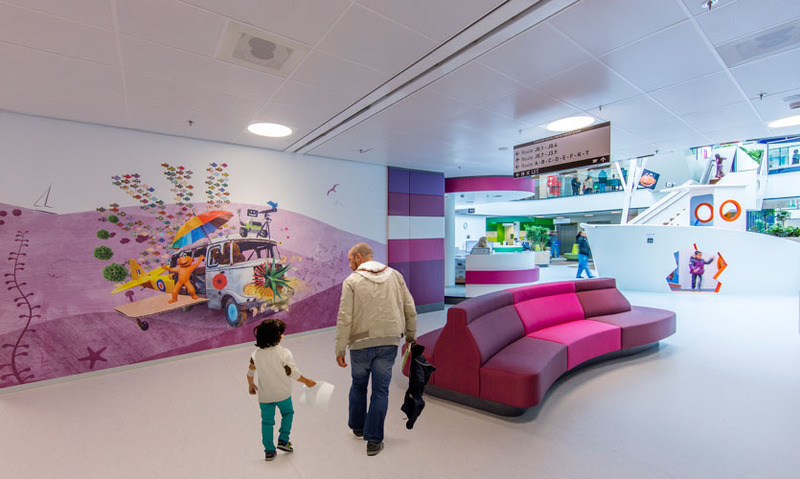 The Juliana Children’s Hospital in The Hague (the Netherlands) is one of the largest pediatric hospitals in The Netherlands. It was designed by MVSA Architects (consortium VolkerWesselsHaga) using patient-centered Planetree design concepts including natural light, ease of orientation and a welcoming, hospitality-oriented ethos. To provide this warm and welcoming environment, Tinker Imagineers was contracted to add an experiential layer to the existing clinical design. 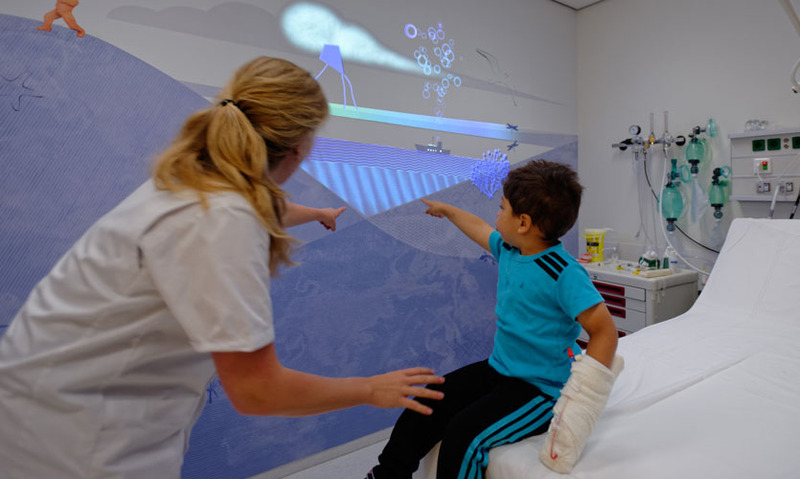 The firm’s approach was to create an “adventure journey” for the young patients’ treatment process. All over the hospital, games, play sets, interactives, drawings and puppets are installed to surprise, distract or relax the children. All elements are connected with a comprehensive storyline so parents and nurses can tell stories, and the children feel surrounded by an alternative environment and fantasy friends, especially important during lonesome nights and frightening treatment. Visiting a hospital is quite a stressful experience for children as well as parents and other family members. 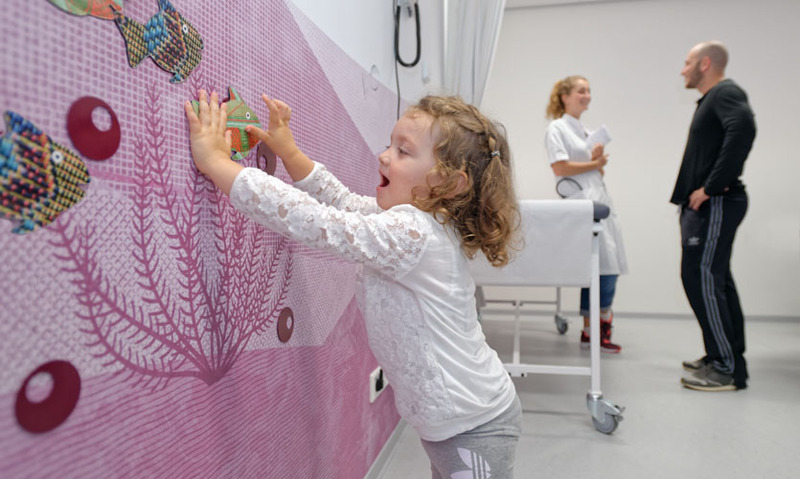 Research shows that a child-friendly, distracting environment reduces stress, fear and the perception of pain in sick children, which helps them to recover sooner and contributes to a more positive hospital experience. 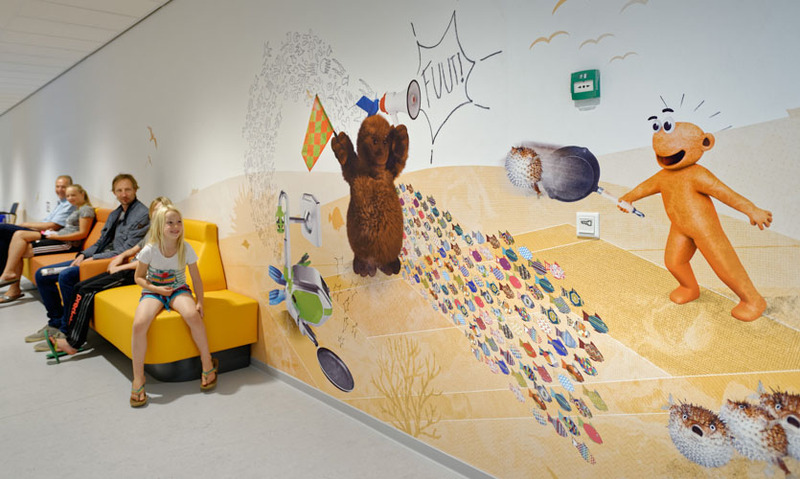 The main focus of the design was how young patients experience their hospital visit. Tinker Imagineers mapped the patient journey through the hospital with the perspective of a child in mind. For example, at the OR-zone, the firm’s 3D designer was transported through the corridor and sluice in a hospital bed to investigate what kind of distraction is needed (intensity, with sound or not, what side of the room, stage of interaction, etc.). The team consistently implemented solutions that address the children’s perspective. For example, the buddies accompanying the patients to the OR reappear on iPads in the recovery room to check whether they are feeling well. The design team created five characters (Hug, Happy, Fold, C-bot and Vizzle) that play the main roles in the experience. 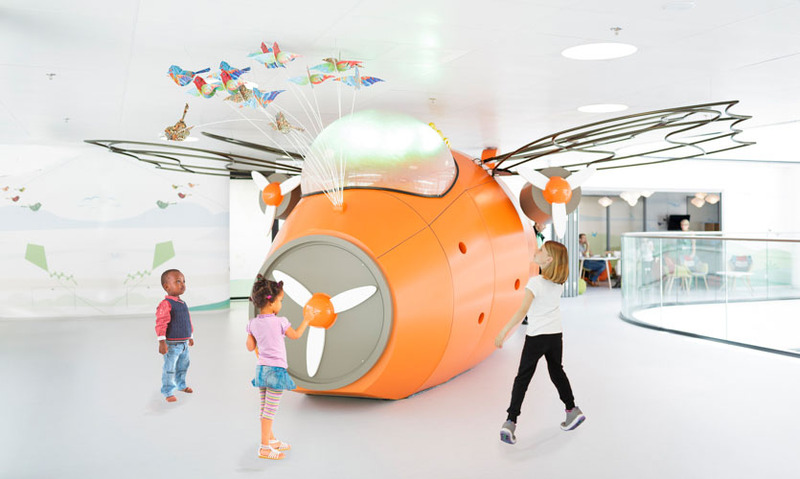 The big idea of the design is that these buddies accompany the young patients and their family on their journey to and through the hospital. They appear everywhere to distract, comfort or provide information. Every character has its own personality, so every child will find one to identify with. 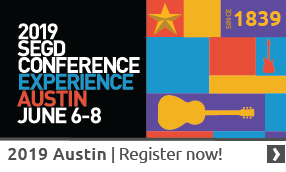 The adventures of the characters (the storyline) are at the basis of the experience design. 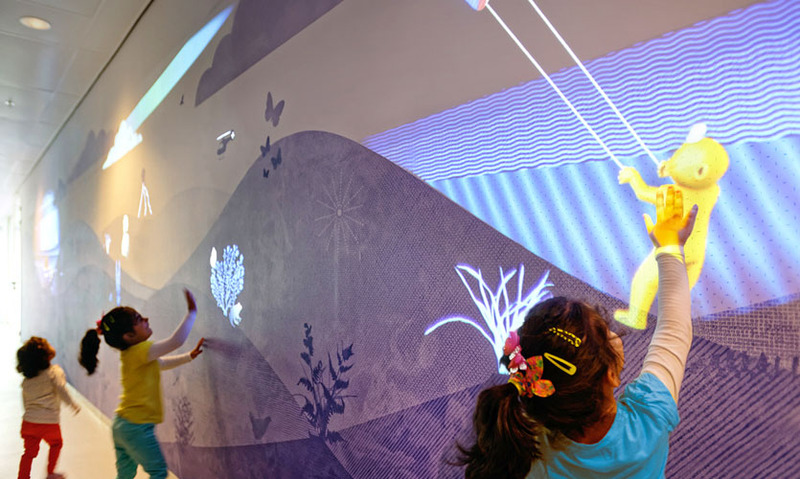 More than 4000m2 of unique graphic design cover the walls of the corridors, waiting areas and treatment rooms in a magical world of sun, sea and sand. Vizzle is a resilient and versatile character represented by a school of fish, which assumes many forms and multiple colors, a do-er and companion who, though a bit shy, is never alone. Computer-like C-bot exists because most of the children are scared of hospital machines. C-bot is rational and technical but optimistic, smart and ever-curious about the medical devices. Knuf (Hug) is like a teddy bear: soft, sweet, loyal. Literally a friend to hug and rely on. Blij (Happy) is extrovert, happy and full of imagination and initiative. Finally, Vouw (Fold) can fold into different shapes, is a controller (with birds-eye perspective) and respects the rules. According to the situation or environment, the characters distract, stimulate to play, challenge or provide information. For example, in the lung function room, patients see Happy blowing bubbles in the background, echoing what they are asked to do during the procedure. The doctors and nurses integrate the graphics into the treatment. 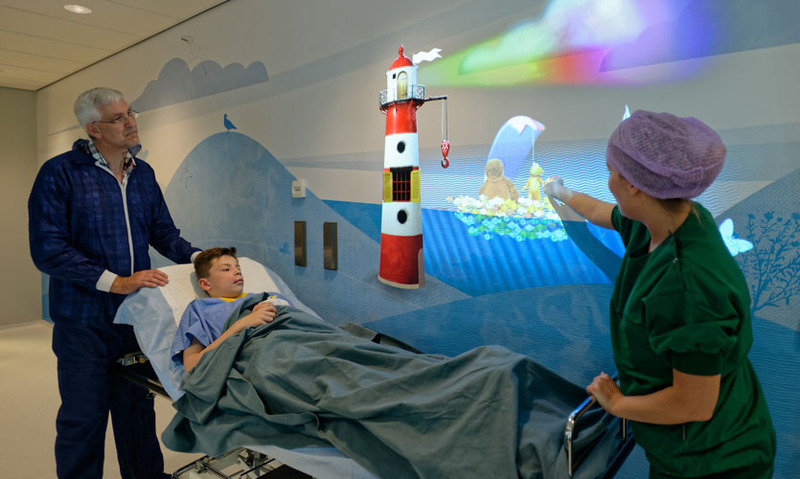 In the most nerve-racking situations, such as the OR zone, the treatment rooms and the elevators, these characters come to life in moving projections and interactive animations. 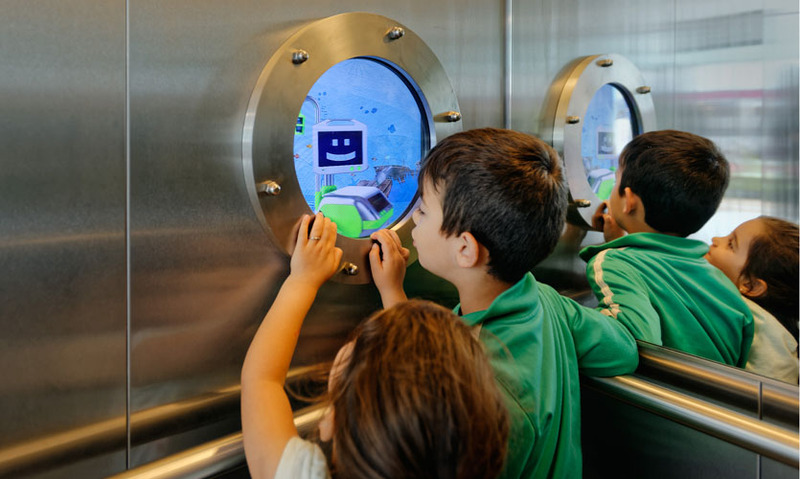 Such an interactive visual installation that reacts to the passers-by has never before been applied in an OR passageway. "I was impressed by the care and attention paid to transitional spaces of the hospital experience. These moments in between are often left behind and yet they are often the places where fear and anxiety are most palpable."